I’ve certainly found this to be true, but it doesn’t always work out this way. On a recent evening, after a draining day, I wanted something nourishing to calm and restore my mood. Perusing one of my “go-to” cookbooks, I chose a salad with tomatoes, chickpeas, and a creamy yogurt sauce to complement the steelhead trout we were baking in the oven. This seemed like a good meal to cap the end of a long day; the trout would come together in a snap, and the salad sounded simple enough — as it actually was - and on another day, I’m sure I would have found it delightful. But on this particular day, the recipe felt ponderous, with too many steps: season the tomatoes and let them sit over here, prepare the sauce and let it sit over there, bring together the chickpeas with the fresh herbs, then toss the whole thing together and serve. By the time we sat down to eat, I was cranky from the prep, not really hungry, and was actually feeling hostile toward the salad. In retrospect, it makes me laugh: Why was I so grouchy? Looking back, I know I wasn’t mad at the salad — which really was a lovely jumble of ingredients— but frustrated with myself for not listening better to my mood, and choosing something simpler so that dinner-making would be the treat that I was seeking, not the drudgery it became. Preparing dinner the very next night, I vowed not to repeat that experience. Instead, I took a minute to check my energy and my mood, and chose the meal I wanted to prepare with intention accordingly. Craving a pick-me-up after another harried day, I again decided to make salad for dinner. This time, though, I tailored the meal to my tired-out mood. I made the salad the entire main course, piling the ingredients free-form in the bowl: fresh greens at the base, with assorted extras on top straight from the fridge (shavings of raw broccoli and cauliflower, a handful of toasted pepitas, a few green olives olives, some crumbles of goat cheese, and slices of cold andouille sausage). Easy and perfect. Next I sought to give some ballast to the salad with one tuck of something special in the bowl. For inspiration, I opened my well-worn copy of “Laurel’s Kitchen,” a classic vegetarian cookbook published in the 70’s. 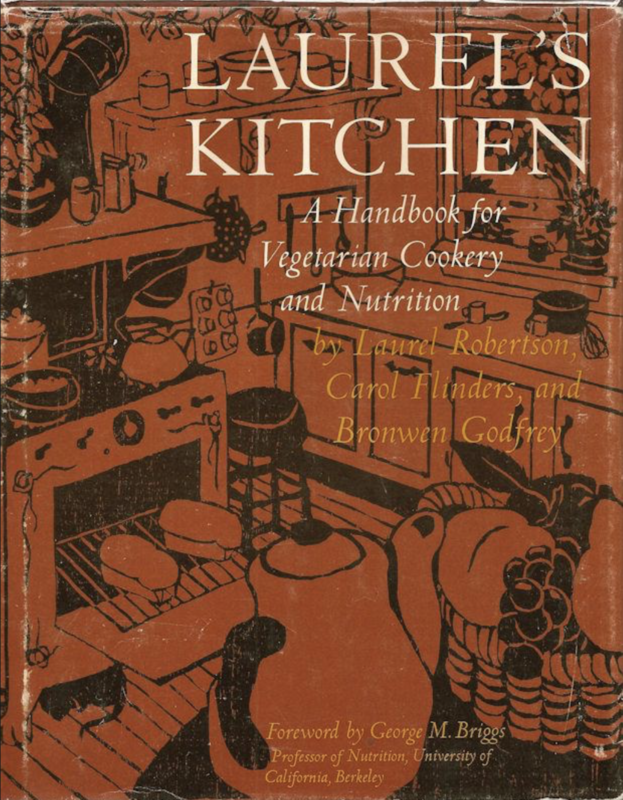 This had been one of my “go-to” cookbooks as a teenager, and just the sight of its simply-designed, dark-brown cover did bring on a rush of memory of cooking dinner for my mom after she came home from the store, just the two of us in the condo. Blue jeans, sandals, tank tops, music. Thumbing through the pages, I found the recipe I was looking for, Laurel’s Persian Rice Salad. I hadn’t made the recipe in years, but I knew it would come together quickly through the ease of memory and steps. When it was done, it was just as I remembered it to be: a delicious combination of bland white rice balanced and flavored with the sharpness of scallions, the acidity of lemon, and the sweet smoothness of olive oil, dates and toasted cashews. That week’s tale of two salads taught me a lesson that I want to remember: Sometimes, the answer to a hectic day is to lose yourself in a recipe with a bunch of ingredients and steps. This in itself can be cathartic and diverting. However, there are other times, when the answer is to keep it simple, with ingredients and steps that are mindless and few. This can be rewarding, too. And sometimes, the food itself is not even the point, it’s the memory or the feeling or something else altogether that you are seeking, that you find through the meal and the making. Here is the recipe for the happy Persian salad. Dress rice with combined olive oil, lemon juice, and dill weed. Add salt to taste. Combine with scallions, cashews (or almonds), and dates and serve immediately. (If you can’t serve right away, set the cashews or almonds aside and add them just beforehand.